I welcome to Gluten Free Philly all of the new subscribers and site visitors that have stopped by recently. Monday's post featured the area gluten-free baker Cookies ... For Me? The company makes year-round and seasonal cookies and brownies that are not only gluten free, but also egg, nut and dairy free. This week, I learned that Bensi, an Italian restaurant chain with area locations in Wyomissing and North Wales, Pennsylvania and Hamilton and Sicklerville, New Jersey has gluten-free pasta, which is cooked in separate pots. The restaurant's soups, salads and most grilled and sauteed dishes can be prepared gluten free. I reported weeks ago that P.F. Chang's China Bistro was planning to add a gluten-free beef entree to its menu. Mongolian Beef and Pepper Steak dishes are the likely candidates. KIND Healthy Snacks announced this week that on Friday, February 5, Starbucks will sample KIND Fruit & Nut Delight and Cranberry Almond+Antioxidants bars at all U.S. locations. KIND bars are among the gluten-free snacks at Starbucks I wrote about last week. Virago Bakery & Cafe in Lansdale, Pennsylvania has gluten-free pizza by the slice on Fridays and Saturdays. Joan's GF Great Bakes, whose bagels I reviewed last month, will be introducing bialys (to my knowledge, a gluten-free first). and corn bread soon. The newest gluten-free pudding flavor from Kozy Shack is chocolate hazelnut. 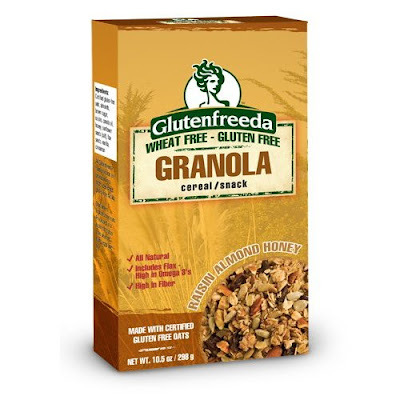 Glutenfreeda's three varieties of gluten-free granola - Raisin Almond Honey, Apple Almond Honey and Cranberry Cashew Honey - are now available for purchase online at Amazon.com. Amazon ships an 8-pack for $30.77 (per-box price of $3.85). Holistic health counselor Maura Shenker will speak on celiac disease and gluten intolerance at the Whole Foods on Callowhill Street in Philadelphia on Tuesday, January 28. The free program runs from 6 p.m. to 7 p.m. Stop by the store's customer service desk or call 215-557-0015 to sign up. Jessica at BucksMontMom.com wrote to tell me that she is hosting an event at the Ann Taylor Loft at Valley Square in Warrington, Pennsylvania on Friday, January 29 from 6 p.m. to 9 p.m. A $5 donation at the door will go to benefit Kids With Food Allergies. Attendees will receive 20 percent off their purchase (not including sale items), plus an additional 15 percent off if they open a store charge. The first 75 people to attend will receive a goody bag. And that, my friends, is all for this week. Have a great weekend!